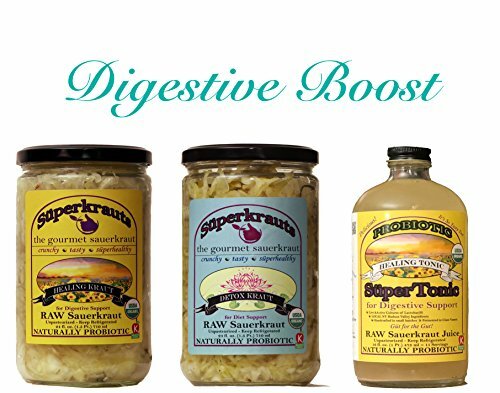 Digestive Boost combo-pack: raw fermented sauerkraut, organic, probiotic, kosher and unpasteurized No shipping charges with this combo pack. HEALING KRAUT is Onion Free, so important for some people with digestive issues! DETOX Kraut helps your body renew itself and get rid of heaviness that may be slowing you down. Juniper Berries: slightly diuretic, helps move things along, relieves inflammation. Red Clover: Powerful tonic, supports the lymphatic system. Stinging Nettle: Helps your kidneys eliminate waste. Burdock Root: Helps purify blood and supports adrenals. Milk Thistle: Support for your liver, helps expel toxins. Dandelion Root: Full of antioxidants and flavonoids. Liver support. Lemon Balm: Promotes wellness and relaxation, lifts your spirits. Lavender: Aromatic flower that clams your nerves and soothes the whole system. And it is Onion Free! HEALING SUPERTONIC: Quick & easy probiotic boost to your gut flora! Pure Raw Sauerkraut Juice from our Healing Kraut, a tonic full of live active probiotic cultures, enzymes, electrolytes and minerals. FREE SHIPPING Priority Mail with this purchase! NOTE: We ship this unrefrigerated. Our krauts are kept refrigerated until they are ready to ship. They can be sent unrefrigerated as it takes many days for the live cultures to restart the process of fermentation. There is no danger of spoilage or harm to the live cultures during shipping. Raw Lacto-Fermented in Glass Vessels, hand-crafted in small batches using 100% Organic ingredients and salts of the highest quality. Unpasteurized and free of vinegars or preservatives, to keep their wonderful probiotics alive! If you have any questions about this product by Superkrauts, contact us by completing and submitting the form below. If you are looking for a specif part number, please include it with your message. Grill combo-pack: raw fermented sauerkraut, organic, probiotic, kosher and unpasteurized No shipping charges with this combo pack.